Early old color example of this influential map of the Holy Land. 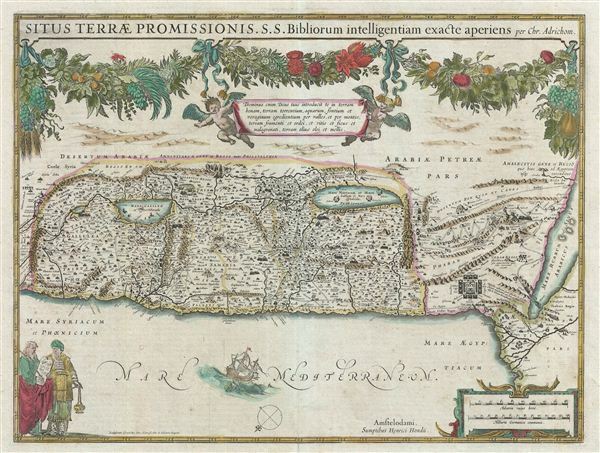 A fine 1633 old color example of Christian van Adrichom's map of the Holy Land, Israel, or Palestine drawn, published by Jodocus Hondius. Oriented to the east, this map covers the whole of the Holy Land on both sides of the Jordan River from the desert of Moab to the Mediterranean and from modern day Lebanon to egypt's Nile Delta. The map is divided according to the Twelve Tribes of Israel while the portions of the map to the south of the Dead Sea show the Wandering of the Israelites in the Desert – a forty year episode from exodus. Throughout tiny vignettes illustrate episodes from Biblical lore ranging from the encampment of the Israelites in the desert to the parting of the Red Sea to the lost Dead Sea cities of Sodom, Gomorra, Schoim, and Adama. Fishing boats populate the Sea of Galilee and major roadways and other trade routes are noted included. The upper portions of the map are decorated with putti and an elaborate floral garland hanging suspended from the title. In the lower left quadrant Moses and Aaron discuss the tablets of the Law. Two distance scales contained within a strapwork border appear in the lower right. A further vignette, bottom center, illustrates Jonah and the Whale. This map was issued by Gerard Mercator and Jodocus Hondius in the third volume of their influential atlas, Le Nouveau Theatre du Monde, published in 1639. Later examples appeared in several other atlases and were also taken up by other cartographers, most notably Jan Janssonius in 1653. Mercator, G. and Hondius, J., Le Nouveau Theatre du Monde, (Amsterdam, French edition) 1636. Very good. Original centerfold. French text on verso. Original platemark visible. Wide clean margins. Laor, E., Maps of the Holy Land: Cartobibliography of Printed Maps, 1475 - 1900, #23C.